If you love flowers or grow them, you need Ariella Chezar’s The Flower Workshop, which is a gorgeous, inspiring guide to arranging flowers. 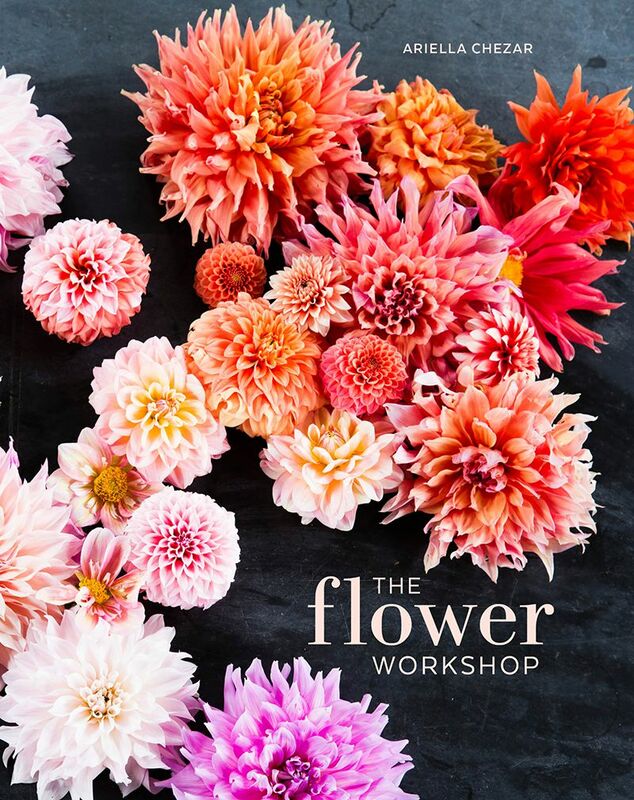 If you’ve ever felt intimidated or frustrated by the armful of blooms you’ve bought at a farmer’s market or roadside stand, floral designer Ariella Chezar’s The Flower Workshop: Lessons in Arranging Blooms, Branches, Fruits and Foraged Materials, is the floral arranging guide for you. Chezar leads flower workshops in NYC, has her own flower farm, been featured in Martha Stewart Living, the New York Times and numerous other publications. She’s even designed flowers for the White House, you know, the one on Pennsylvania Ave. So, girlfriend knows her flowers. Experience a visual delight: The book is oozing from cover to cover with vibrant photos of flowers, which seem to grow off the page. The photos were shot by Erin Kunkel. Gain flower knowledge: Chezar provides information about flowers and a bit of their history and growing advice as well as her favorites. She also covers, vines, greenery and other supporting characters in arrangements. One section of her book provides step by step instruction to create several floral arrangements in every color. She includes a list of necessary tools and supplies. (Do you know how to use a flower frog?) She lists flowers available by season: spring, summer and fall. Chezar dissects elaborate arrangements stem by stem. Inspiration: the book includes the designer’s tips for getting through the winter months when the only blooms might be found at a grocery store and what to do with those stems once you get home. Her piece about foraging will make you want to drop everything to hunt outside for branches, mosses and other botanical findings. Growing advice: The designer drops tips throughout her book about good flowers to grow, varieties she likes, and how to ensure a supply of flowers throughout the warmer months. Think outside the vase: Chezar provides tutorials on creating flower masterpieces outside of the traditional vases, urns and pitchers. There are instructions for making a hair garland, a citrus wreath and a cascading bridal bouquet to name a few. If you grow flowers in your garden, collect wildflowers on hikes or make regular stops at a flower stand or market, you need a simple, inspiring floral arranging guide like The Flower Workshop. You’ll be able to maximize your flower investments by employing even just a few of Chezar’s tips. Chezar has me thinking about my most-hated flower, the marigold, in a whole new light with a tutorial on how to make a marigold curtain. That curtain is a must-see. “Written by a celebrated floral designer and lavishly illustrated with full-color photography, this book not only provides step-by-step instructions for 50 stunning floral projects from simple to spectacular, but also equips readers with the skills to customize arrangements at home. “Whether hosting a party, helping out with a friend’s wedding, or wishing to incorporate the beauty of flowers into everyday life, The Flower Workshop allows you to create dazzling arrangements that go beyond merely pretty and into realms of the dramatic, the unexpected, and sometimes even the magical. Written by a celebrated floral designer and lavishly illustrated with full-color photography, this book not only provides step-by-step instructions for more than forty-five stunning floral projects from simple to spectacular, but also equips you with the skills to customize arrangements at home. Listen: Debra Prinzing interviewed Ariella Chezar for the Slow Flowers Podcast a few years ago. Let’s chat: what are your favorite flowers? Are you comfortable arranging them? If so, do you have any tools, tips, techniques you would share with the rest of us? My favorites are the showy, in your face, flowers: peonies, dahlias, ranunculus, roses and gladiolas and zinnias. I love lilacs too but they’re more of a shrub, right? Blogging for Books provided me a with a review copy of The Flower Workshop. This sounds like a great resource for flower lovers! Thank you for sharing! It really is McKenzie. I re-read it again this spring. I think it has earned a permanent spot on my bookshelves!